For many of you, this situation will seem all to familiar. 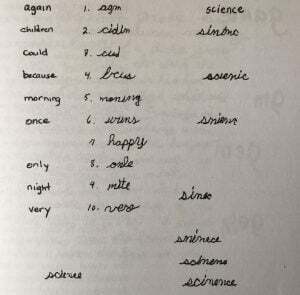 Rather than give a list of unrelated words, her teacher should group similarly spelled words and use color coding to visual break down words into simpler parts. For example: sci en ce. How many letters are in science? 7. Tap them out and spell the word letter-by-letter. How many are in red? green? blue? Can you circle the ‘sci’ in words like scientific, scissors, scientist, science, and fascinate? Practice such is a more efficient way to learn than having a student try a misspell a word several different ways.